associated proteins (red), which are a hallmark of human muscle. 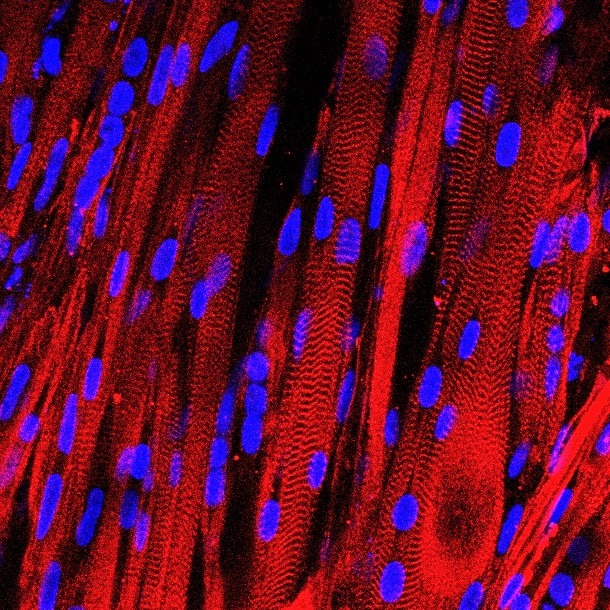 ﻿In a laboratory first, researchers have grown human skeletal muscle that contracts and responds just like native tissue to external stimuli such as electrical pulses, biochemical signals and pharmaceuticals. The lab-grown tissue should soon allow researchers to test new drugs and study diseases in functioning human muscle outside of the human body. The research appears in the journal eLife. The researchers started with a small sample of human cells that had already progressed beyond stem cells but hadn't yet become muscle tissue. They expanded these "myogenic precursors" by more than a 1000-fold, and then put them into a supportive, 3D scaffolding filled with a nourishing gel that allowed them to form aligned and functioning muscle fibers. The researchers subjected the new muscle to a barrage of tests to determine how closely it resembled native tissue inside a human body. They found that the muscles robustly contracted in response to electrical stimuli - a first for human muscle grown in a laboratory. They also showed that the signaling pathways allowing nerves to activate the muscle were intact and functional. To see if the muscle could be used as a proxy for medical tests, the researchers studied its response to a variety of drugs, including statins used to lower cholesterol and clenbuterol, a drug known to be used off-label as a performance enhancer for athletes. The effects of the drugs matched those seen in human patients. The statins had a dose-dependent response, causing abnormal fat accumulation at high concentrations. Clenbuterol showed a narrow beneficial window for increased contraction. Both of these effects have been documented in humans. Clenbuterol does not harm muscle tissue in rodents at those doses, showing the lab-grown muscle was giving a truly human response. The goal of the researchers is to use this method to provide personalized medicine to patients. They can take a biopsy from each patient, grow many new muscles to use as test samples and experiment to see which drugs would work best for each person. Originally posted by Duke University.